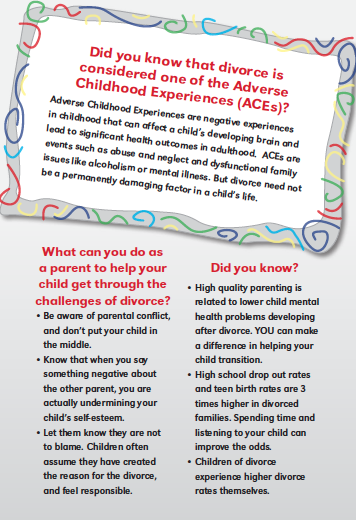 The research includes the CDC’s Adverse Childhood Experience Study (ACE Study), studies that show how toxic stress damages children’s brains, and economic analyses that shows how prevention programs reduce health, criminal justice and social service costs. factors in all of its systems to counteract and prevent adverse childhood experiences. Research shows that ACEs cost communities dearly in police and emergency response, juvenile justice, welfare and other social services, education, courts, prisons, and, most important — lives lost. — Small reminders. Creating parent “Did you Know” cards, one for each ACE. English and Spanish versions will be available on the organization’s web site soon. Since they have no more state funding, they’re selling these — 10 ACE cards for $10 — along with our other products and services. Last week, 40 elementary school Early Head Start teachers and staff participated in a workshop led by Dr. Steven Taylor, who reviewed the Collaborative Problem Solving model of Ross Greene (author of the Explosive Child and Lost at School). They’re planning an upcoming workshop in Detroit next week hosted by the Detroit-Wayne County Mental Health Agency. They talked with Washington State Penitentiary officials about training staff and inmates about ACEs and resilience next year. — Celebrating progress and setting new goals. They’re planning their biennial Children’s Forum in April 2013, which will focus on how Walla Walla is grappling with child abuse. At the last forum, the school board voted unanimously to close all schools for the morning so that every staff person and teacher could attend a session in which Dr. John Medina explained how toxic stress affects children’s ability to focus and learn in school. That resulted in Lincoln High School changing its entire approach to school discipline and seeing an 85% drop in suspensions in one year as a result. For next year’s forum, they’ll update the Data Book, a compilation of trends using 16 indicators that they’ve been measuring in Walla Walla since 1998. They’ll release the Walla Walla County Behavioral Risk Factor Surveillance System data, which includes the community’s ACE scores. — Looking out for the next generation. And this week, Walla Walla’s largest hospital, St. Mary’s, will distribute, for the second time, CRI’s new-parent brochure (available in English and Spanish) in baby bags that go home with new infants. 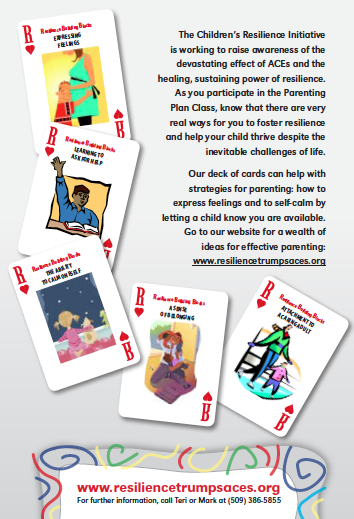 The brochure offers parents ten parenting tips that include information on resilience and ACEs. The concept is simple – connect those who need help with those who can help. It might begin with a mother who is diagnosed with cancer and a father who leaves his job to help her. They lose the car and the kids begin acting out, said Dr. Beth McMahon, president of Favors Forward. On average for two to three months, that family receives the help they need, with meals, a cleaning crew, transportation and positive skill building for the children. “The hardship is mostly felt by kids acting out,” McMahon said. The children are given an opportunity to try something they always wanted to learn, such as gymnastics or music. By learning that skill, it helps reduce the sense of hopelessness, she said. In North Carolina, juvenile crime has dropped at twice the national average — 37 percent drop in violent crimes since 2002, and a 40 percent drop in property crimes — after a changes that were started by the state 15 years ago, according to this story by NewObserver.com reporter Thomasi McDonald. Linda Hayes, who runs the state Division of Juvenile Justice and Delinquency Prevention, gives the community programs a large share of credit for the drop in juvenile crime. She says the division works with parks and recreation departments, United Way and other nonprofits, businesspeople, members of the clergy, substance abuse professionals, mental health providers, juvenile court counselors, and local community folk to assess the needs of young people. Those partnerships have led to strategies to reduce youth crime and an array of mental health intervention and substance abuse treatment, counseling and mentoring, along with rehabilitation for juveniles and their families, including court-ordered parenting classes. The aim is to meet the needs of children who are, on average, three to four grade levels behind their peers and to forge strategies to reduce the number of children of color in detention. The state of Delaware is investing $1 million to integrate trauma-informed practices state-wide, according to this story by DelawareOnline.com reporter Beth Miller. During a two-day conference in Dover this week, the state convened hundreds of workers from social service agencies, behavioral health programs, schools, mental health agencies and the criminal justice system to show the evidence behind the shift. They hope to change the way state agencies and others approach people in crisis. A trauma-informed system rests on the belief that in settings where it can be expected that there will be individuals who’ve been exposed to trauma—like a mental health clinic or family court—that everyone who works there should have a basic understanding of trauma and how it impacts individuals. This knowledge is then applied to how an organization does business in terms of everything from the physical environment to paper work and actual services provided. The primary reason a trauma-informed approach is taken is to minimize the chance of inadvertently retraumatizing someone. When an intentional, trauma-informed culture is fully integrated from the policy level through daily practice, the potential for healing emerges and, at the same time, the likelihood of exacerbating the behaviors that may have the child on a costly path toward disability or juvenile justice involvement greatly diminishes.